MP3Resizer is designed to optimize the capacity of your portable music player by reducing the size of MP3 files. This is especially useful when listening to MP3 files or MP3 Audio books on a mobile phone, MP3 player, Pocket PC, etc. JPG PNG Resizer reduces the file size of your JPG and PNG images quickly and conveniently. It's fast, uses little memory and supports huge images. Lossless Audio Converter is a simple and handy utility for converting between most popular lossless audio formats: FLAC, WAV, ALAC (Apple Lossless Audio), WMA Lossless, WavPack, APE (Monkey's Audio). MP3 OGG WMA Size Reducer is a universal program for reducing the size of the three most popular lossy audio formats: MP3, OGG Vorbis, WMA (Windows Media Audio). JPG PNG Resizer 1.01 released! M4AResizer - an M4A AAC file size reducer and M4A ALAC to AAC converter. Lossless Audio Converter 1.20 released! MP3Resizer for Mac 1.50 released! JPG PNG Resizer 1.00 released! MP3 OGG WMA Size Reducer 1.11 released! Scanique 1.00 build 7 released! MP3 OGG WMA Size Reducer 1.10 released! MP3Resizer for Mac 1.00 released! Lossless to Lossy Audio Converter 1.55 released! Lossless to Lossy Audio Converter 1.50 released! Lossless to Lossy Audio Converter 1.15 released! Lossless Audio Converter 1.10 released! Lossless to Lossy Audio Converter 1.10 released! 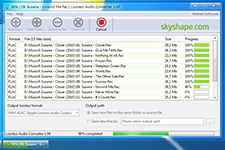 Lossless Audio Converter 1.00 released! MP3 OGG WMA Size Reducer 1.00 released! Seven Classic Start 1.75 released! MP3Resizer Express 1.1 (build79) released!